Join us in supporting the Soil Association’s seasonal campaign for Organic September. Our organic Spelt flours, cereals and grains are a great way to introduce delicious, nutritious ingredients into your everyday favourites, they also offer a healthy alternative to wheat. Transform simple breakfasts and last minute suppers with the nutty flavours of the Spelt grain combined with seasonal favourites from the veg patch and hedgerows. By farming organically, we are able to produce Spelt grain for our range of products in the most nutritious and sustainable way. No pesticides, no fertilisers and naturally grown here in Somerset our Spelt fields are a haven for wildlife, bees, birds and butterflies. As with all organic food it is traceable from farm to fork so you can be sure that what you are eating is the best. The best food is always prepared with the best possible ingredients, which is something we actively encourage. Where food comes from, how it is processed and why it matters so much all contribute to the final taste, nutritional value and health benefits of our general wellbeing. The flourish of harvesting activity in late September brings with it a crescendo of autumnal optimism and an abundance of inspiration to make healthy, hearty meals for friends, family or just for fun. Get inspiration to put Organic on the menu and in lunch boxes by checking out some of the Spelt recipes available on our website and in ‘Spelt’ by Roger Saul, where you can also discover the science behind the grain. From pizza and pasta to soups, sauces and sweet treats, by using Organic Spelt as a key ingredient you will be celebrating sustainable, seasonal eating with a healthy provenance and tradition. 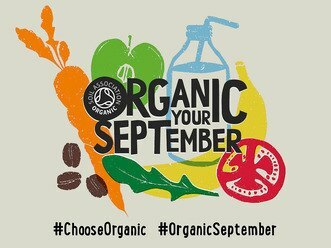 So, whether you are baking buns or biscuits support the soil association’s Organic September this month by choosing organic.